Background: The ‘Organizational Justice’ concept is used in order to determine whether the administrator is fair to his personnel or not. It is said that those who get bullied are usually terrorized, annoyed, excluded, belittled, deprived of resources, isolated and prevented from claiming rights. Objective: The purpose of this study is to determine nurses’ perception of organizational justice and its effect on the bullying behaviour they are exposed to. Methods: The cross-sectional study was conducted on nurses at a university hospital and a private hospital in Ankara. In this regard, 250 nurses who had been serving in their respective hospitals for 6 months participated in the study. The variables were measured under 2 categories: bullying and perception of organizational justice. A simple regression analysis was carried out in order to determine the bullying behaviour which causes the nurses’ justice perceptions. Results: According to the survey, the nurses are most likely to perceive injustice in the area of distributional justice. Results revealed that the ratio of nurses who were exposed to bullying in the workplace was 28%. There was a significant and negative relation between the nurses’ distributional justice perception and the bullying they were exposed to. Conclusion: The employees whose organizational justice perceptions are low, display a threatening and negative behaviour towards their colleagues and the institution. They feel themselves to be threatened when they think that they can’t communicate with upper management respectfully and also when they believe that their managers are unjust in performance assessment, in assessing salaries and promotion. Colquitt JA. On the dimensionality of organizational justice: a construct validation of a measure. J Appl Psychol. 2001;86(3):386-400. doi: 10.1037/0021-9010.86.3.386. Özmen Ö N T, Arbak Y, Özer P S. An inquiry about the effect of justice value on justice erception. Ege Academic Review. 2007;7(1):17-33. Heponiemi T, Elovainio M, Kouvonen A, et al. The effects of ownership, staffing level and organisational justice on nurse commitment, involvement, and satisfaction: a questionnaire study. Int J Nurs Stud. 2011;48(12):1551-1561. doi: 10.1016/j.ijnurstu.2011.05.015. Brunet L, Morin A, Savoie A, et. al. Empowering Employees: The Moderating Role of Perceived Organisational Climate and Justice. Can J Behav Sci. 2010:42(4);201–211. doi: 10.1037/a0020465. 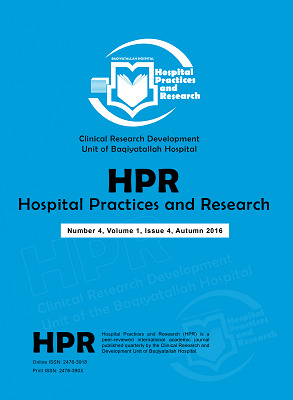 Hatam N, Fardid M, Kavosi Z. Perceptions of organizational justice among nurses working in university hospitals of shiraz: a comparison between general and specialty settings. Nurs Midwifery Stud. 2013;2(4):77-82. doi: 10.5812/nms.10637. Gür E. Organizational justice perception and burnout situations of nurses working in public, private and university hospitals [thesis]. Ankara: Gazi University Graduate School of Health Sciences; 2014. Liljegren M, Ekberg K. The associations between perceived distributive, procedural, and interactional organizational justice, self-rated health and burnout. Work. 2009;33(1):43-51. doi: 10.3233/WOR-2009-0842. Özsoy Z, Ekici D. Perception of Nurses Regarding Organizational Justice and Ethical Behavior; Organızational Culture in Hospitals. Hosp Pract Res. 2017;2(2):41-46. doi:10.15171/hpr.2017.11. Dilek Y, Aytolan Y. Development and psychometric evaluation of workplace psychologically violent behaviours instrument. J Clin Nurs. 2008;17(10):1361-1370. doi: 10.1111/j.1365-2702.2007.02262.x. Yildirim D. Bullying among nurses and its effects. Int Nurs Rev. 2009;56(4):504-511. doi: 10.1111/j.1466-7657.2009.00745.x. Yildirim D, Yildirim A, Timucin A. Mobbing behaviors encountered by nurse teaching staff. Nurs Ethics. 2007;14(4):447-463. doi: 10.1177/0969733007077879. Yıldırım D, Yıldırım A. Sağlık Alanında Çalışan Akademisyenlerin Karşılaştıkları Psikolojik Şiddet Davranışları ve Bu Davranışların Etkileri (Mobbing behaviors encountered by health science faculties staff and their responses to them). Türkiye Klinikleri Tıp Bilimleri Dergisi. 2010:30(2):559-570. doi: 10.5336/medsci.2008-9832. Cleary M, Hunt GE, Horsfall J. Identifying and addressing bullying in nursing. Issues Ment Health Nurs. 2010;31(5):331-335. doi: 10.3109/01612840903308531. Murray JS. Workplace bullying in nursing: a problem that can’t be ignored. Med Surg Nurs. 2009;18(5):273-276. Stebbing J, Mandalia S, Portsmouth S, et al. A questionnaire survey of stress and bullying in doctors undertaking research. Postgrad Med J. 2004;80(940):93-96. doi: 10.1136/pmj.2003.009001. Ekici D, Beder A. The effects of workplace bullying on physicians and nurses. Aust J Adv Nurs. 2014;31 (4):24-33. Rutherford A, Rissel C. A survey of workplace bullying in a health sector organisation. Aust Health Rev. 2004;28(1):65-72. doi: 10.1071/AH040065. Yildirim A, Yildirim D. Mobbing in the workplace by peers and managers: mobbing experienced by nurses working in healthcare facilities in Turkey and its effect on nurses. J Clin Nurs. 2007;16(8):1444-1453. doi: 10.1111/j.1365-2702.2006.01814.x.